Kitiana is a 15 year old girl. 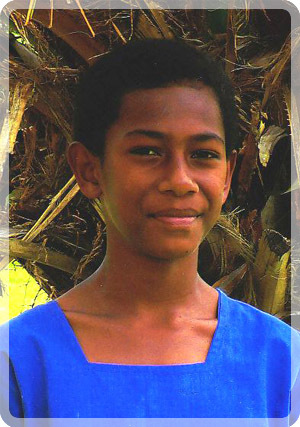 Kitiana lives with her Mum and Dad in a small village outside Sigatoka. She has a younger brother and sister who also need to attend school. The family earns a living by farming a small area of land which provides food for the family to eat. They sell the remainder for a small cash income but struggle with school fees and related costs for their children. Kitiana enjoys attending school and her favourite school subject is all subjects. When she is not at school she loves to play netball. Kitiana travels to school each day by carrier van. When she grows up, Kitiana wants to be a Primary Teacher. Academically Kitiana is bright. She is a neat worker and regularly attends school.